Among the standard steel tube sizes are the square tube steel. Due to the symmetrical view of steel square tubes, they are commonly used for columns and braced frame members. These structural steel tube sections are very common at large warehouses, department stores, shopping mauls, and office buildings where these square tube steel are exposed to view. **For A36 rectangular tube pricing click here or here for A36 square tube pricing.These links will prompt to select the tube size. For rectangular tubes the letters A & B represent the two sides, and C represents the thickness. For square tubes A represent the two sides and B thickness - all dimensions are inches, conversions to millimeters are also available. Once the tube size is selected a screen with pricing will appear. Please note these tube sizes are A36 steel, when using the design formula shown below to select the tube size needed, use Fy 36 ksi in lieu of 46 ksi, everything remain the same. 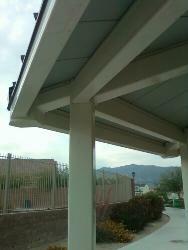 Square steel tubes can also be found at trellis framing mainly for architecturally exposed steel. 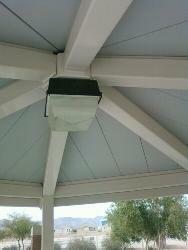 They are also found in patio cover framing support. 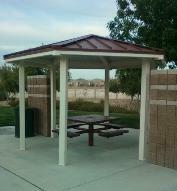 In the patio cover application such as shown in these photos, they are used for aesthetic reasons rather than the tube steel strength. The term overkill is used to describe when too much steel are used in certain situation, that is the case in these photos. The selection of the 6x6 tubes as well as the close proximity of the framing members to each other were for aesthetic reason. The other factor that affects the size of tube steel to use is connection. By using the same tube size make welding them together a lot easier. These 6x6 tubes are used for column supports as well as roof rafters to support the metal roof deck. Smaller steel square tubes are very common for guardrails, security fences and steel gates. This application can both be interior and exterior use. For stair framing application, square tube steel are commonly found at stair landing framing, some time used as stair stringers and balcony rails. These applications are true at both commercial and industrial facilities.